After hearing the modern, pop-rap music blare through the car windows of teens, it can feel impossibly boring to listen to slower, gloomier tracks; however, White Lies’ new album Five makes the transition a tad bit easier. Filled with a total of nine songs, Five is definitely different than most albums you hear on the radio. Rather than the typical upbeat, fast-paced music, this album is full of slow, thoughtful lyrics. Each song was fairly long in time, ranging anywhere from three to seven minutes. Lead singer Harry McVeigh’s vocals can be described as nothing less than rich, deep, and beautiful. His voice captures my attention as he sings about failed love and toxic relationships. Although it has good rhythm, there was hardly any variety. Each song sounded extremely similar to one another. At first, it wasn’t bad. In fact, it was fairly calming. However, after listening to several songs that sound almost exactly alike in tempos, beats, and rhythms, it can leave a bad taste in your mouth. Five was a very love based album- or the lack thereof. White Lies sang about the failures of romance and made love sound fatal. I was definitely picking up on some 80’s post-punk vibes, and it filled me with a sense of nostalgia. It made me want to slow dance around an empty room, or party all night in a club when life was at its peak. In short, I was both disappointed and pleased with this album. It was slow, long, and repetitive in sound, but it was also nostalgic and calming. I wish there had been more variety, but it was decent. If you’re into upcoming pop and rap artists like Cardi B, I wouldn’t recommend this album. If you like sadder, gothic type music, Five is perfect for your next Spotify playlist. White Lies, originally formed in London, is a band formerly known as “Fear of Flying”. The core band members are Harry McVeigh (lead vocals, guitar), Charles Cave (bass guitar and backing vocals), and Jack Lawrence-Brown (drums). 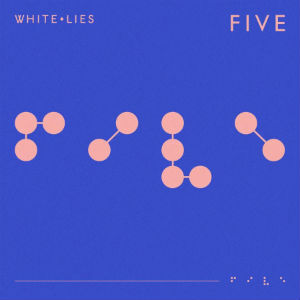 Formed in October 2007, Five is White Lies’ fifth album. They’ve toured, released singles, and performed at festivals. Their debut album, To Lose My Life, was released in 2009. Although they have matured, Five sounds similar to previous albums.